The epitome of comfort food with a (pork) kick. In a small bowl, mix together sugar, salt, chili powder, onion, garlic, paprika, cayenne, coffee; then, rub all over pork. Place pork in a slow cooker, pour in BBQ sauce, and let it cook on high for 8 hours. Shred pork with 2 forks. Let it sit in the slow cooker. Spray the bottom of an 8-by-11-inch glass baking dish with nonstick spray. In a bowl, combine pulled pork and baked beans. Spread the mixture in the bottom of the casserole dish and top with shredded cheese. Then, add a layer of tator tots on top. Bake for about 30 minutes, or until tator tots are starting to turn golden brown and the casserole is just slightly bubbling at the sides. Remove from oven, and sprinkle the tator tots with more cheese. 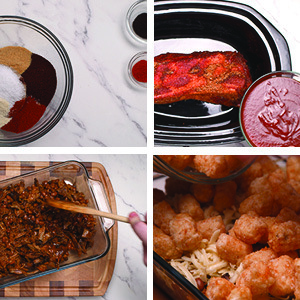 Bake for 5–10 minutes to let the cheese melt and the tator tots to crisp. Grab your fork, spoon or spatula and friends, and dig into this Midwesterners’ dream dish!